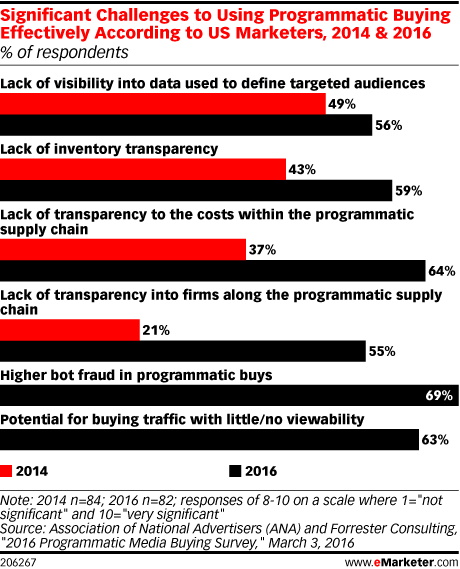 Data is from the March 2016 Association of National Advertisers (ANA) and Forrester Consulting "2016 Programmatic Media Buying Survey." 128 US senior marketers were surveyed during February 5-24, 2016. Respondents identified their job levels as senior (director, VP and SVP) (57%), manager (32%) and other (11%). Respondents were from B2B (13%), B2C (57%) and a mix of B2B and B2C (30%) companies.